What is Confidence Coaching for Life? Confidence Coaching is a confidential process designed to support you to identify and achieve the goals you have in life. It involves challenging your perceptions, mindset and beliefs about yourself and others. 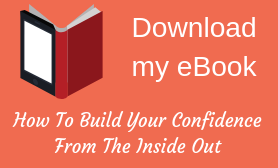 The focus is also on practical tips and techniques to build your confidence in the areas where you have self-doubt. My coaching process involves challenging your thinking and behaviours, which can be enlightening but uncomfortable at times, however it is also exciting, inspiring and great fun! I look forward to sharing a journey of discovery with you. The number and length of sessions will depend on the programme you choose and your needs. The sessions which are totally confidential, will be based around a series of conversations and the use of some interesting exercises. Sessions can be Face to Face in Bishop’s Stortford or you can use Skype, Facetime or telephone, which are equally successful. How much is Confidence Coaching? This depends on the programme you choose and as I’m very open about the amount of investment in time and money for each programme you’ll find details on each page. To book a free initial chat please contact me by email or phone. Don’t forget to sign up for My Top 10 Confidence Tips and loads more free information.